Sometimes, the final score doesn't truly reflect how a sports contest really went. 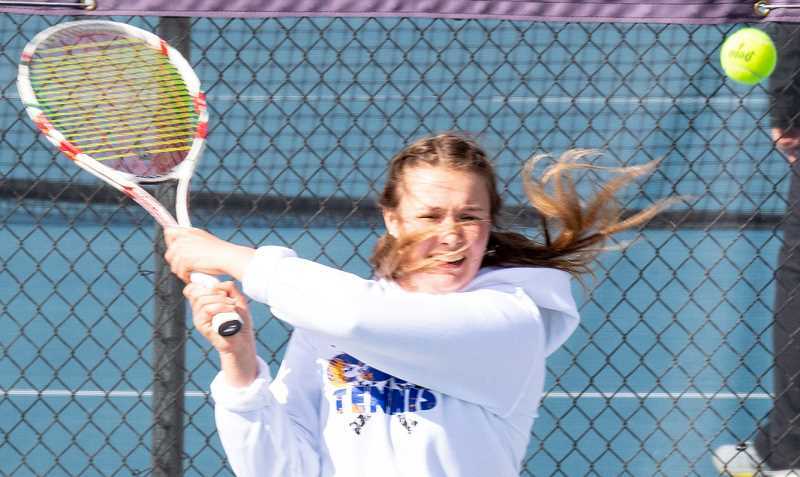 Such was the case on Tuesday, as the Redmond Panthers defeated the Crook County Cowgirls 6-2 in an Intermountain Conference tennis matchup. The final score makes it look like the Panthers were runaway winners. However, when looking at individual matches, the host Cowgirls had several chances to earn more wins. Redmond's Ingrid Harris, a former Crook County youth tennis player, took control early, defeating Olivia Cooper 6-2, 6-1 in No. 1 singles action. It was the only match all afternoon that the Panthers won by a blowout score, and even that is deceptive as Cooper forced Harris into a series of lengthy points as she pushed Harris virtually every point of the contest. Redmond's Jessalyn Loza kept things rolling for the Panthers, taking the first set against Kaylee Carr 6-3 in No. 2 singles action. However, Carr rallied, taking the second set 6-1 to set up a tiebreaker, which Loza won 10-8. In No. 3 singles action, Redmond's Taylor Cordell cruised to a 6-0 win in the first set. However, Crook County's Ashley Reynolds rallied in the second set, at one time holding a 4-3 lead before finally falling 6-4. The Cowgirls picked up their first win of the afternoon as No. 4 singles player Hannah Love rolled past Karol Gomes 6-1, 6-0. The victory gave the Cowgirls life. The Cowgirls won again in No. 1 doubles as Tansy Clark and Marlen Ceja escaped Jhonna Nunez and Melody Acevedo 6-1, 6-4. Then came the match that turned out to be the turning point for the dual. Crook County's Katelynn Gibson and Alena McCabe took the first set of their match 6-2. The duo had a chance to win the second set but finally fell 7-6, before losing the tiebreaker 7-4 to Maria Gradilla and Dagne Harris in No. 2 doubles play. At No. 3 doubles, Mariah Knight and Kristie Chu kept things close for the first set against Daisy Altimarano and Sopria English, falling 11-9 in the opening set. However, Altimarano and English came alive in the second set, taking a 6-1 victory. Then in the final set of the night, the Panthers' Ava Wolf and Annetta Garcia defeated Crook County's Gracie Slawter and Natalie Cross 6-2, 6-3, sealing the victory for the Panthers. The Cowgirls were on the road at The Dalles on Thursday. The team then finishes a busy week at Madras on Saturday as they compete in the eight-team Madras Invitational. The Cowgirls return home on Tuesday, April 16 as they host Hood River Valley in a 4 p.m. match.